Emenil Plus : Each film-coated tablet contains Meclizine Hydrochloride USP 25 mg and Pyridoxine Hydrochloride BP 50 mg.
Meclizine is a piperazine-derivative antihistamine that is used as an antiemetic. It has antiemetic, anticholinergic and antihistaminic properties. It reduces the sensitivity of the labyrinthine apparatus. The action may be mediated through nerve pathways to the vomiting center (VC) from the chemoreceptor trigger zone (CTZ), peripheral nerve pathways, the VC, or other CNS centers. Pyridoxine is vitamin B-6. It has been added to enhance the anti-emetic effects & as a dietary suppliment. Prevention and treatment of nausea, vomiting, dizziness, motion sickness, radiation sickness and vertigo associated with diseases of the vestibular system (e.g. Ménière's syndrome, labyrinthitis and other vestibular disturbances). 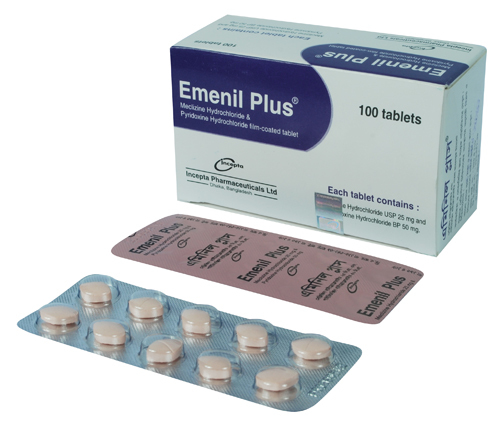 Emenil Plus is administered orally. Adult and Children 12 years of age & over: Nausea and vomiting: 25-50 mg daily or as directed by a physician. Motion sickness: Take an initial dose of 25-50 mg, 1 hour prior to travel. May repeat the dose every 24 hours for the duration of the journey. Radiation sickness: 50 mg administered 2-12 hours prior to radiation treatment. Vertigo: 25-100 mg daily in divided doses. Prevention of nausea and vomiting associated with emergency contraceptive pill (ECP) : 25-50 mg, 1 hour before first ECP dose; repeat if needed in 24 hours. The safety and efficacy for use in children less than 12 years of age have not been established. Drowsiness, dry mouth and, on rare occasions, blurred vision have been reported. Patients should be warned that Meclizine Hydrochloride may impair their ability to perform hazardous activities requiring mental alertness or physical coordination (e.g., operating machinery, driving a motor vehicle). Patients should avoid alcoholic beverages while taking this drug. Due to its potential anticholinergic action, this drug should be used with caution in patients with asthma, glaucoma or enlargement of the prostate gland. Pregnancy: Category B. Large scale human studies have not demonstrated adverse fetal effects. It has been suggested that based on available data, Meclizine presents the lowest risk of teratogenicity and is the drug of first choice in treating nausea and vomiting during pregnancy. Lactation: Safety for use in the nursing mother has not been established.